India as a sub-continent is enormously vast with each region having it’s own myriad of flavors. The cuisine changes with every state and even sometimes every few kilometers. Considering the riches, spices and trade destination that India was at a point of time in history, it has seen it’s fair share of conquests. The Mughals, British, Portuguese, Persians and lot of other cultures have played an important role in reshaping Indian Cuisine. To say that Indian food is immaculately complex would be understatement. But where do you reach the point of retracing back the roots of popular dishes? Many of them have been re-structured to suit local palates while many popular dishes have been lost in history. Partition too had a crucial role in reshaping the food scene in the Indian sub-continent. Among the appetizers we got to sample were the Dudhiya Kebabs and Singaras. The Singaras are not to be confused with the traditional Samosas we get among other parts of India. It is a lot different than the samosa with fillings of peanuts and potatoes which might be peeled or unpeeled. The Dudhiya Kebabs were my favorite. Packed with lots of nuts and cheese, these were an absolute melt in the mouth. The Lahori Chicken Keema Kebab had been borrowed from our neighboring country. Cooked on a grill the Lahori Chicken Keema Kebabs had a delicate, smoky flavor and went well with the fresh mint chutney. Now the main courses were the part which had us excited. Most of the dishes we got to sample that night borrowed heavily from Sindh and Baluchistan. I could perfectly understand Chef Manik Mangotra’s thought of utilizing his crew which has some fine Sindhi chefs among them. Nevertheless to say the Dal Pakwan and Koki were wonderfully delicious. I’ve had the fortune of eating at a couple of Sindhi households in my time and the taste of the dishes at the table did remind me of those. There is always that one dish that you base your dinner about once you walk out. 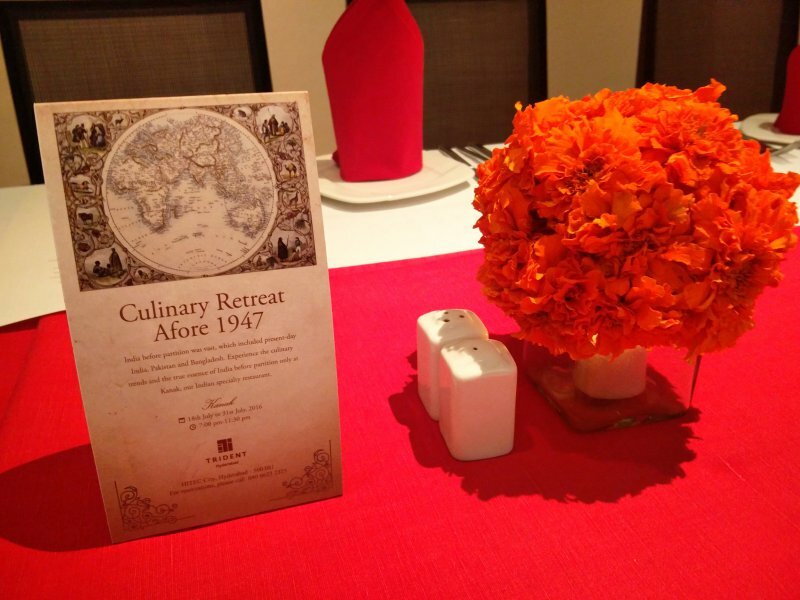 But for us with the dinner that night at “India Afore 1947”, there were two. One was the Bhindi Gosht, a Balochistan style lamb curry cooked with okra. But I definitely have to give special mention to the Balochi Murgh Sujji. The Balochi Murgh Sujji is a simple roast chicken but what gave it the depth of flavor were the spices. It felt a lot similar to the Afghani Sajji but yet the flavors of pepper, fennel and lemon were highlighted. We ended the wonderful meal with Mohanthal, a sindhi dessert and Chenna Jalebi. It almost felt like two extremities of the Indian sub-continent on a dessert plate. The only thought I’d add about the “India Afore 1947” food festival at Kanak isn’t just about the dishes alone. I’ve gone to Kanak numerous times earlier to have known the quality of cooking and food that Chef Manik and his team serves. This festival is about undertaking a challenge. A challenge to not let dishes be lost in modern-cooking and tracing back their history. Location : Kanak, Trident Hyderabad, Opposite Cyber Towers, Hitech City.